The visual team planner for agencies, studios, and firms. For when a spreadsheet just won’t cut it. Plan projects in seconds. Make updates easily. See changes as they happen. Always in sync. Anywhere, anytime. 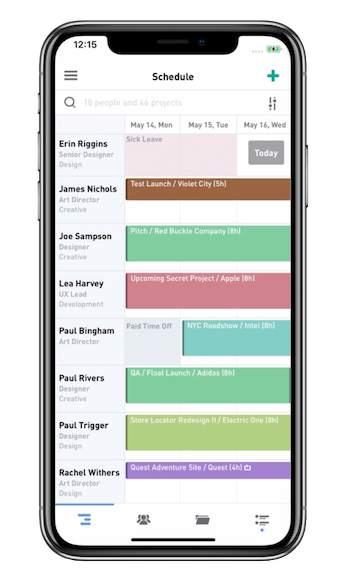 Your team will always be up-to-date with the latest schedule changes with apps for iPhone, iPad, Slack, Zapier and lots more. A single source of truth, for your entire team. Built for modern teams like yours. When you need the right tool for the job, choose the solution built from the ground up to help teams plan their time. Digital product studio Okay Bueno. Teams in more than 150 countries are scheduling thousands of tasks each and every day. Here’s what they're saying. I did months of comparison and it was the streamlined interface that made the difference. The only resource scheduling app we've found to help us stay on top of our department. An amazing tool which has transformed the way we book in work in our organisation. A great visual collaborative tool for managing resources. It's easy to use, flexible, and simple to get up and running. While we pride ourselves on how simple things are to get started, rolling out new software is never easy. That’s why we offer free demonstrations, webinars, video tutorials, and email and phone support.